There is huge knowledge gap in our understanding of many terrestrial carbon cycle processes. In this paper, we investigate the bounds on terrestrial carbon uptake over India that arises solely due to CO 2 -fertilization. For this purpose, we use a terrestrial carbon cycle model and consider two extreme scenarios: unlimited CO2-fertilization is allowed for the terrestrial vegetation with CO2 concentration level at 735 ppm in one case, and CO2-fertilization is capped at year 1975 levels for another simulation. 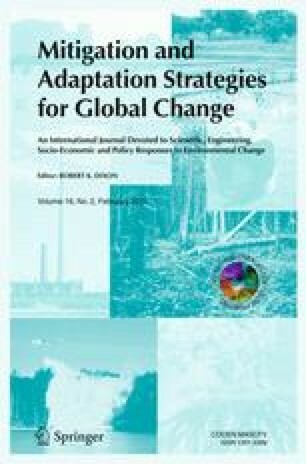 Our simulations show that, under equilibrium conditions, modeled carbon stocks in natural potential vegetation increase by 17 Gt-C with unlimited fertilization for CO2 levels and climate change corresponding to the end of 21st century but they decline by 5.5 Gt-C if fertilization is limited at 1975 levels of CO2 concentration. The carbon stock changes are dominated by forests. The area covered by natural potential forests increases by about 36% in the unlimited fertilization case but decreases by 15% in the fertilization-capped case. Thus, the assumption regarding CO2-fertilization has the potential to alter the sign of terrestrial carbon uptake over India. Our model simulations also imply that the maximum potential terrestrial sequestration over India, under equilibrium conditions and best case scenario of unlimited CO2-fertilization, is only 18% of the 21st century SRES A2 scenarios emissions from India. The limited uptake potential of the natural potential vegetation suggests that reduction of CO2 emissions and afforestation programs should be top priorities. Research for this publication was conducted under the project “Impact of climate change on tropical forest ecosystems and biodiversity in India”, funded by the Royal Norwegian Embassy, in collaboration with CICERO, Oslo. We thank the Royal Norwegian Embassy and CICERO for their support. We thank Dr. Devaraju for his help in making the schematic diagram for this paper.